To mark the Golden Jubilee Celebration of His Majesty, the Sultan and Yang Di-Pertuan of Brunei Darussalam’s Accession to the Throne, the Autoriti Monetari Brunei Darussalam (AMBD) has issued a commemorative Brunei dollar (BND) 50 polymer note and a range of Golden Jubilee banknote sets. Extremely limited international allocation for all numismatic sets. Brunei Darussalam and Singapore’s currencies are interchangeable and can be exchanged at par. The Singapore Mint is the appointed exclusive international marketing agent for the Autoriti Monetari Brunei Darussalam. 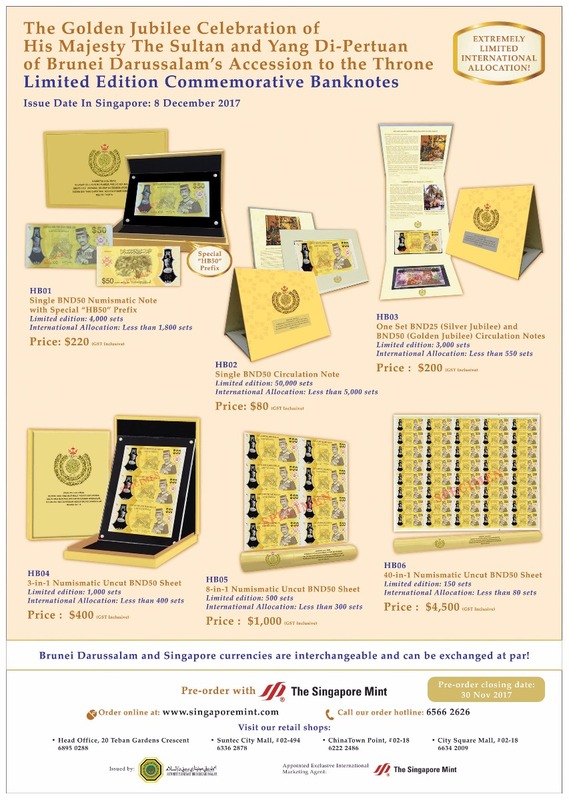 Available for sale online is also His Majesty's 70th Royal Birthday limited edition commemorative coin sets and Brunei uncut polymer notes. Rare vintage Brunei coins and notes are exclusively available at The Singapore Mint retail stores.